Now that you ask, I’ve been eyeing Hild. There’s been good stuff said about it, though as you said, its “heft” sort of intimidates me, and I wouldn’t say historicals are my favorite though I do read them occasionally. It is not a breezy read. I’m glad I read it, because it’s one of those historical novels that really makes me want to go out and research the time period. Griffith is also an excellent writer. Best read when you have some time to really immerse yourself in it. Looking at the Zelazny and Brunner and thinking I need to get around to those, too. I’m one of those annoying people who makes my reading list for the month and acquires nothing more than those books. Ooh, I like this idea. I am going to have to start doing this. It will probably be incredibly disturbing to see in print the discrepancy between what I buy and when I read it. 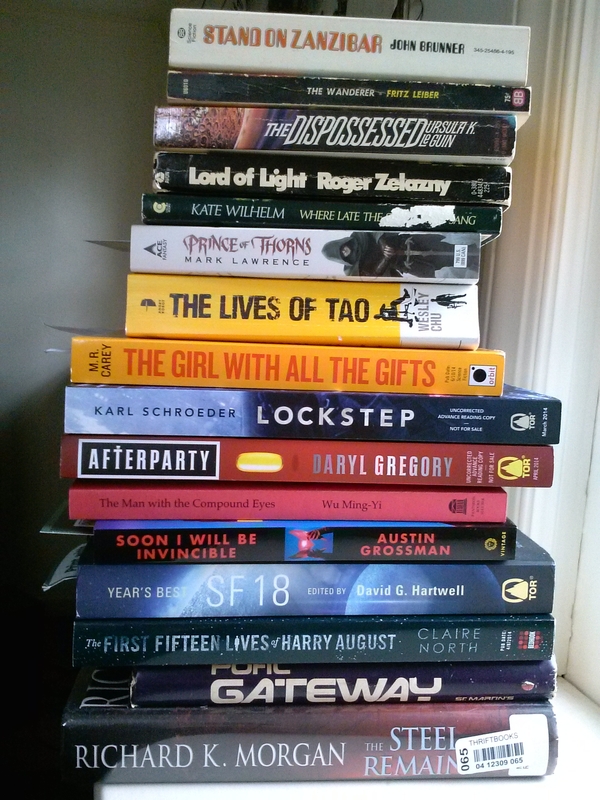 And for the record, I would be interested in also seeing the non-spec books in the pile. I shall include non-speculative stuff next time! I’ve just spent the last two years reading most of the Hugos. So from your pile, I’d recommend The Dispossessed, Lord of Light, Where Late the Sweet Birds Sang, and Gateway. I’ve heard some good reviews of Love Minus Eighty. I’m reading Lord of Light for my bookgroup next month. Dispossessed is good, but Le Guin in general doesn’t do it for me. I really liked Love Minus Eighty! It surprised me.